This undated and unsigned mandala was painted in the late 1980's on the raw and unprimed Irish linen canvas that John Miles commonly used. He left the corners of this five-foot square canvas empty, while the soft interior of its outer halo is sprayed with a blue ring of aniline dye. A mass of nebulous structural forms emerge from the edge of the inner mandala with its countless calligraphic spiral and natural structures. 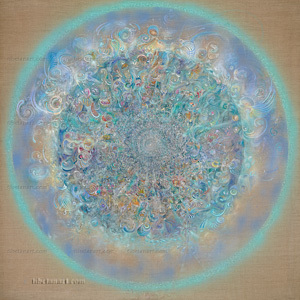 And the heart of this mandala emerges from a luminous tunnel of spiraling nebula-like forms, giving the whole composition a soft feminine quality that mirrors the gentle pulse of Mother Nature in her most benign and nourishing aspect. "Paranoia" - I see the beautiful twigs on the beech trees at the bottom of next door's garden. Suddenly it is as if they have taken on the animosity of people who don't like me. I am sensitive about all those forces, which my spirit seems to conjure up to oppose me. The ultimate fear would be for the whole of nature to gang up against me. I have reached new depths of illness and despair. There is so much more to do with my art. I am desperate to finish my work before I die, but I am too ill to do anything without dramatic medical help or a miracle. I wonder what would have happened if Art had been my sole life and not marriage, children and Blackie! Perhaps I would be famous and not the broken forgotten being that feebly writes this. I realize that this may appear strange, but I feel that I must write and say something about your paintings at the National Eisteddfod.